This sushi recipe requires a bamboo sushi mat for rolling. 6 sheets nori, cut each in half, so, 12 sheets in total. 1)PLACE the rice in a rice cooker. When the rice is done, put the cooked rice into a large bowl. 2)MIX together the vinegar, sugar and salt in a small bowl until the sugar dissolves, then drizzle over the rice. MIX together gently to coat the rice with the sushi vinegar, then set aside to cool to room temperature. 3) put one nori sheet on the sushi mat, put the rice on it, use a big spoon’s back to flat the rice sticky on the nori sheet. 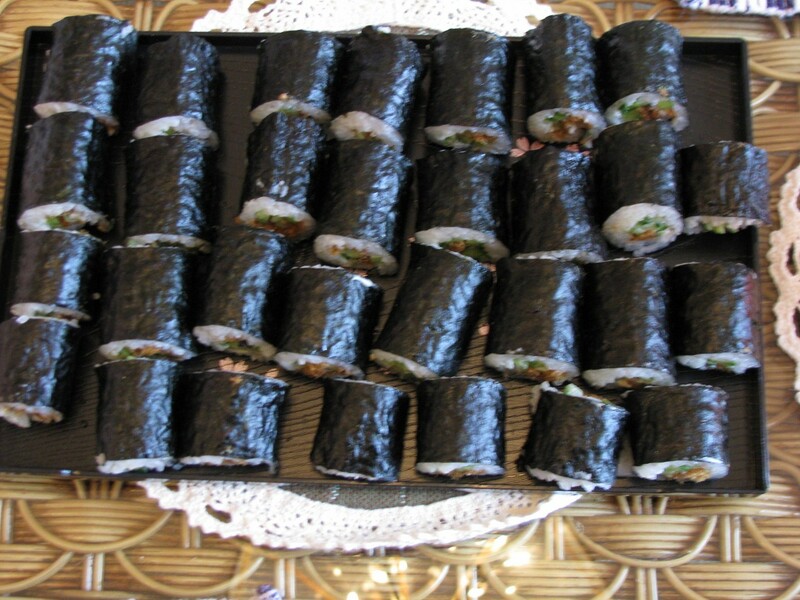 4)put the fillings at one end, roll it up; then use the mat to make it tight. 5) cut into 1 inch rounds to serve.